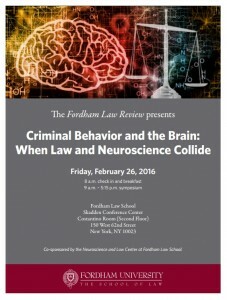 The Fordham Law Review in co-sponsorship with the Fordham Neuroscience and Law Center present an all day Symposium entitled Criminal Behavior and the Brain: When Law and Neuroscience Collide on Friday, February 26, 2016. The line-up of speakers is impressive; see the brochure. This symposium examines a variety of cutting-edge, at times controversial, linkages between law and neuroscience, ranging from social and environmental influences on the brain and behavior to the interpretations of neuroimaging to the prediction of criminality and predispositions towards mental illnesses and addictions. The registration is open and those interested can earn up to 4 professional practice and 2 ethics CLE credits. Students should consider attending and learning more about this fascinating subject.